This cookbook provides guidance on how to configure the NSX firewall, load balancing, and NAT/SNAT services for Pivotal Cloud Foundry (PCF) on vSphere installations. These NSX-provided services take the place of an external device or the bundled HAProxy VM in PCF. 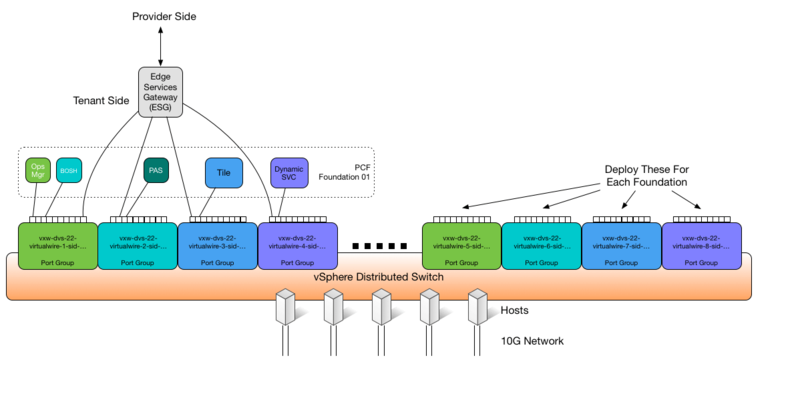 This document presents the reader with fundamental configuration options of an Edge Services Gateway (ESG) with PCF and vSphere NSX. Its purpose is not to dictate the settings required on every deployment, but instead to empower the NSX Administrator with the ability to establish a known good “base” configuration and apply specific security configurations as required. If you are using NSX, the specific configurations described here supersede any general recommendations in the Preparing Your Firewall topic. The ESG can scale to accommodate very large PCF deployments as needed. There are five non-routable networks on the tenant (inside) side of the ESG. The Infra network is used to deploy Ops Manager and BOSH Director. The Deployment network is used exclusively by Pivotal Application Service (PAS) to deploy Cells that host apps and related elements. The CF Tiles network is used for all other deployed tiles in a PCF installation. The Services network is used by BOSH Director for service tiles. The Container-to-Container network is used for container to container communication in the Cells. There is a single service provider (outside) interface on the ESG that provides Firewall, Load Balancing and NAT/SNAT services. The service provider (outside) interface is connected appropriately to the network backbone of the environment, as either routed or non-routed depending on the design. This cookbook does not cover provisioning of the uplink interface. Routable IP addresses should be applied to the service provider (outside) interface of the ESG. Pivotal recommends that you apply 10 consecutive routable IP addresses to each ESG. Pivotal recommends that operators deploy the ESGs as high availability (HA) pairs in vSphere. Also, Pivotal recommends that they be sized “large” or greater for any pre-production or production use. The deployed size of the ESG impacts its overall performance, including how many SSL tunnels it can terminate. The ESGs have an interface in each port group used by PCF as well as a port group on the service provider (outside), often called the “transit network.” Each PCF installation has a set of port groups in a vSphere DVS to support connectivity, so that the ESG arrangement is repeated for every PCF install. It is not necessary to build a DVS for each ESG/PCF install. You do not re-use an ESG amongst PCF deployments. NSX Logical Switches (VXLAN vWires) are ideal candidates for use with this architecture. View a larger version of this diagram. The following is an example of a network architecture deployment. The following diagram illustrates container-to-container networking. The overlay addresses are wrapped and transported using the underlay deployment subnet. As a prerequisite, create wildcard DNS entries for system and apps domains in PCF. Map these domains to the selected IP address on the uplink (outside) interface of the ESG in your DNS server. The wildcard DNS A record must resolve to an IP address associated with the outside interface of the ESG for it to function as a load balancer. You can either use a single IP address to resolve both the system and apps domain, or one IP address for each. Typically you have one SNAT and three DNATs per ESG. IP associated for SNAT use: All PCF internal IP addresses appear to be coming from this IP address at the ESG. IP associated with Ops Manager DNAT: This IP address is the publicly routable interface for Ops Manager UI and SSH access. Assign “Internal” Interface IP Address Space to the Edge Gateway. 192.168.28.0/22 = Dynamic Services network for BOSH Director-managed service tiles. 10.255.0.0/16 = Container-to-Container network for intercontainer communication. You must update the security group and load balancer information for your PCF deployments using NSX-V on vSphere through the Ops Manager API. See Updating NSX Security Group and Load Balancer Information for more information. This procedure populates the ESG internal firewall with rules to protect a PCF installation. These rules provide granular control on what can be accessed within a PCF installation. For example, rules can be used to allow or deny another PCF installation behind a different ESG access to apps published within the installation you are protecting. The ESG provides software load balancing functionality, equivalent to the bundled HAProxy that is included with PCF, or hardware appliances such as an F5 or A10 load balancer. This step is required for the installation to function properly. Import SSL certificates to the Edge for SSL termination. 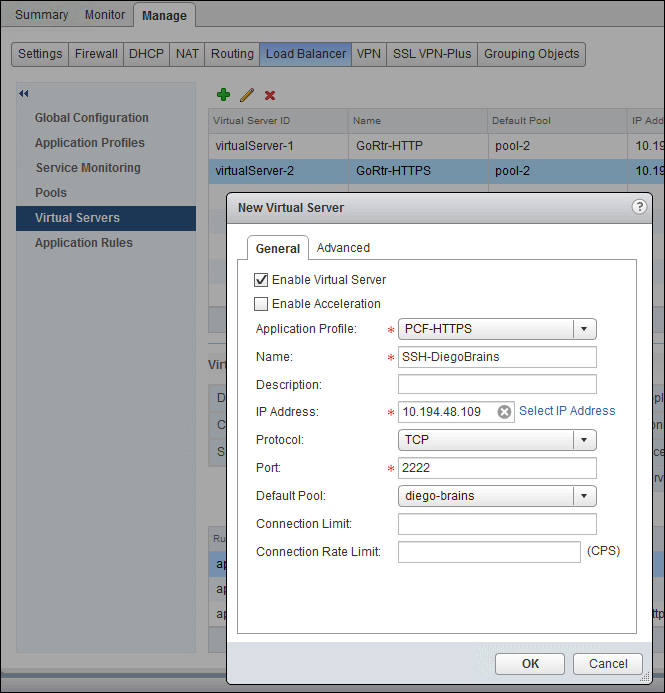 Create Application Profiles in the Load Balancing tab of NSX. Create Application Rules in the load balancer. Create Service Monitors for each pool type. Create Application Pools for the multiple groups needing load balancing. Create a virtual server (also known as a VIP) to pool balanced IP addresses. PEM files of SSL certificates provided by the certificate supplier for only this installation of PCF, or the self-signed SSL certificates generated during PCF installation. In this procedure you marry the ESG’s IP address used for load balancing with a series of internal IP addresses provisioned for Gorouters in PCF. It is important to know the IP addresses used for the Gorouters beforehand. These IP addresses can be pre-selected or reserved prior to deployment (recommended) or discovered after deployment by looking them up in BOSH Director, which lists them in the release information of the PAS installation. PCF requires SSL termination at the load balancer. Note: If you intend to pass SSL termination through the load balancer directly to the Gorouters, you can skip the step below and select Enable SSL Passthru on the HTTPS Application Profile. Select Edge, Manage, Settings, and then Certificates. Click Green Plus button to Add Certificate. Insert PEM file contents from the Networking configuration screen of PAS. Select Edge, Manage, Load Balancer, and then Global Configuration. Edit load balancer global configuration. Set logging to desired level (Info or greater). 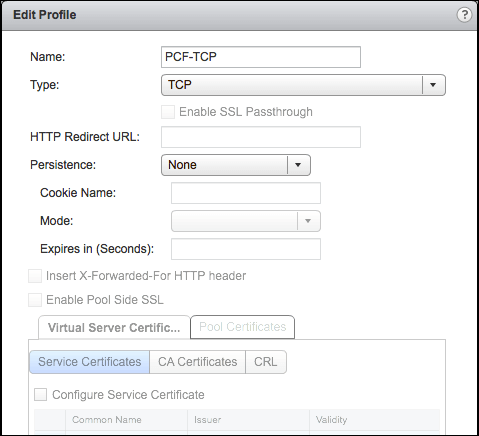 The Application Profiles allow advanced x-forwarded options as well as linking to the SSL Certificate. You must create three Profiles: PCF-HTTP, PCF-HTTPS and PCF-TCP. Select Edge, Manage, Load Balancer, and then Global Application Profiles. Create/Edit Profile and make the PCF-HTTP rule, turning on Insert X-Forwarded-For HTTP header. Create/Edit Profile and make the PCF-HTTPS rule, same as before, but add the service certificate inserted before. If encrypting TLS traffic to the Gorouters, turn on Enable Pool Side SSL. Otherwise, leave it unchecked. Create/Edit Profile and make PCF-TCP rule, with the Type set to TCP. In order for the ESG to perform proper x-forwarded requests, you need to add a few HAProxy directives to the ESG Application Rules. NSX supports most directives that HAProxy supports. Select Edge, Manage, Load Balancer, and then Application Rules. Copy and paste the table entries below into each field, one per rule. NSX ships with several load balancing monitoring types pre-defined. These types are for HTTP, HTTPS and TCP. For this installation, operators build new monitors matching the needs of each pool to ensure correct 1:1 monitoring for each pool type. Select Edge, Manage, Load Balancer, and then Service Monitoring. Create a new monitor for http-routers, and keep the defaults. Set the Type to HTTP. Set the Method to GET. Set the URL to /health. Create a new monitor for tcp-routers, and keep the defaults. Create a new monitor for diego-brains, and keep the defaults. Set the type to TCP. These monitors are selected during the next step when pools are created. A pool and a monitor are matched 1:1. The following steps creates the pools of resources that ESG load-balances to: the Gorouter, TCP Router, and Diego Brain jobs deployed by BOSH Director. If the IP addresses specified in the configuration do not exactly match the IP addresses reserved or used for the resources, then the pool will not effectively load balance. Select Edge, Manage, Load Balancer, and then Pools. Enter ALL the IP addresses reserved for the Gorouters into this pool. If you reserved more addresses than you have Gorouters, enter the addresses anyway and the load balancer ignores the missing resources as “down”. Note: If your deployment matches the Reference Architecture for PCF on vSphere, these IP addresses are in the 192.168.20.0/22 address space. Set the Port to 80 and Monitor Port to 8080. The assumption is that internal traffic from the ESG load balancer to the Gorouters is trusted because it is on a VXLAN secured within NSX. If using encrypted TLS traffic to the Gorouter inside the VXLAN, set the Port to 443. Set the Algorithm to ROUND-ROBIN. Enter ALL the IP addresses reserved for TCP Routers into this pool. If you reserved more addresses than you have VMs, enter the addresses anyway and the load balancer ignores the missing resources as “down”. strong>Note: If your deployment matches the Reference Architecture for PCF on vSphere, these IP addresses are in the 192.168.20.0/22 address space. Set the Port to empty (these numbers vary) and the Monitor Port to 80. Set the Monitors to tcp-routers. Enter ALL the IP addresses reserved for Diego Brains into this pool. If you reserved more addresses than you have VMs, enter the addresses anyway and the load balancer will just ignore the missing resources as “down”. Set the Port to 2222 and the Monitor Port to 2222. Set the Monitors to diego-brains. This is the Virtual IP (VIP) that the load balancer uses to represent the pool of Gorouters to the outside world. This also links the Application Policy, Application Rules, and backend pools to provide PCF load balancing services. This is the interface that the load balancer balances from. You create three Virtual Servers. Select Edge, Manage, Load Balancer, and then Virtual Servers. 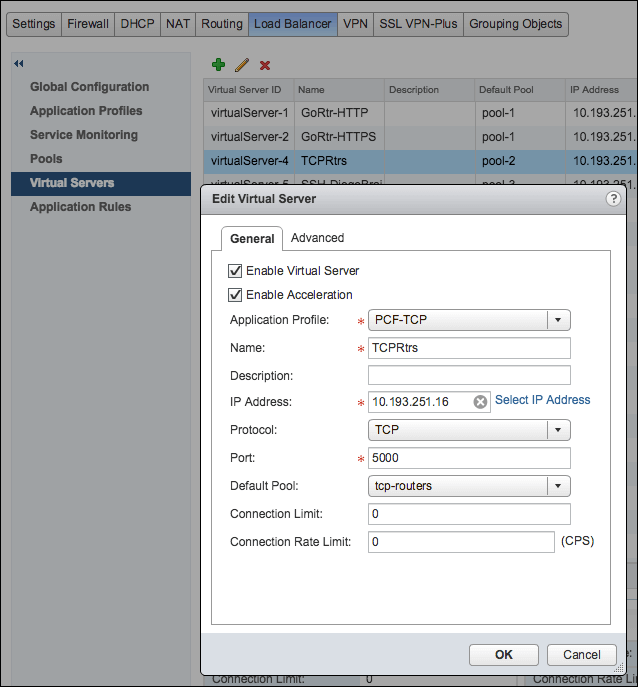 Select an IP address from the available routable address space allocated to the ESG. For information about reserved IP addresses, see General Overview. Create a new Virtual Server named GoRtr-HTTP and select Application Profile PCF-HTTP. Use Select IP Address to select the IP address to use as a VIP on the uplink interface. Set Protocol to match the Application Profile protocol (HTTP) and set Port to match the protocol (80). 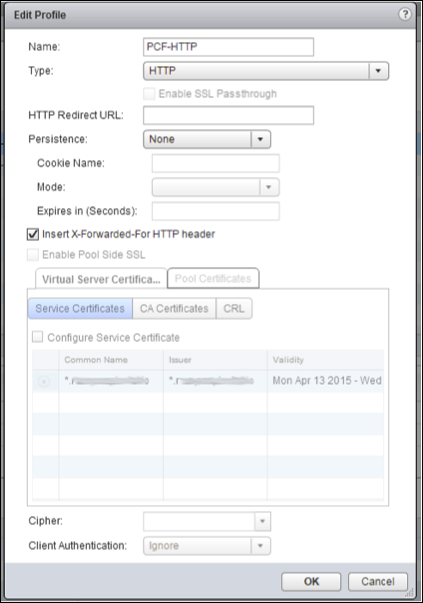 Set Default Pool to the pool name set in Step 2.6a: Create Pool for http-routers. This connects this VIP to the pool of resources being balanced to. Ignore Connection Limit and Connection Rate Limit unless these limits are desired. Switch to Advanced Tab on this Virtual Server. Note: Be careful to match protocol rules to the protocol VIP- HTTP to HTTP and HTTPS to HTTPS. 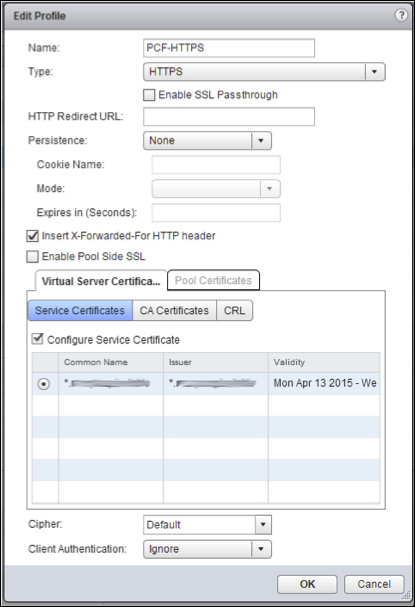 Create a new Virtual Server named GoRtr-HTTPS and select Application Profile PCF-HTTPS. Use Select IP Address to select the same IP address to use as a VIP on the uplink interface. Set Protocol to match the Application Profile protocol (HTTPS) and set Port to match the protocol (443). 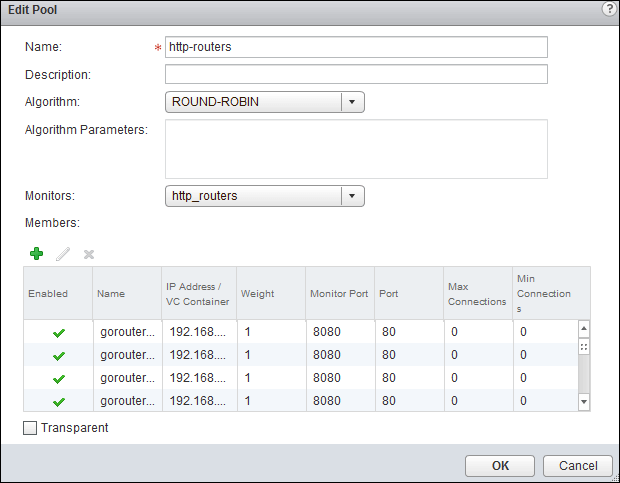 Set Default Pool to the pool name set in Step 2.6a: Create Pool for http-routers (http-routers). This connects this VIP to that pool of resources being balanced to. Create a new Virtual Server named TCPRtrs and select Application Profile PCF-TCP. Set Protocol to match the Application Profile protocol (TCP) and set Port to match the protocol (5000). Set Default Pool to the pool name set in Step 2.6b: Create Pool for tcp-routers (tcp-routers). This connects this VIP to the pool of resources being balanced to. Create a new Virtual Server named SSH-DiegoBrains and select Application Profile PCF-HTTPS. Use Select IP Address to select the same IP address to use as a VIP on the uplink interface if you want to use this address for SSH access to apps. If not, select a different IP address to use as the VIP. Set Protocol to TCP and set Port to 2222. Set Default Pool to the pool name set in Step 2.6c: Create Pool for diego-brains (diego-brains). This connects this VIP to that pool of resources being balanced to. The ESG obfuscates the PCF installation through network translation. The PCF installation is placed entirely on non-routable RFC-1918 network address space, so you must translate routable IP addresses to non-routable IP addresses to make connections. Note: Correct NAT/SNAT configuration is required for the PCF installation to function as expected. Note: The NAT/SNAT on the infra network in this table is an example of an optional Hairpin NAT rule to allow VMs within the Infrastructure network to access the Ops Manager API. This is because the Ops Manager hostname and the API HTTPS endpoint are registered to the Ops Manager external IP address. A pair of Hairpin NAT rules are necessary on each internal network interface that requires API access to Ops Manager. You should create these rules only if the network must access the Ops Manager API. NAT/SNAT functionality is not required if routable IP address space is used on the Tenant Side of the ESG. At that point, the ESG simply performs routing between the address segments. Note: NSX generates a number of DNAT rules based on load balancing configs. You can safely ignore these. The ESG also supports scenarios where Private RFC subnets and NAT are not utilized for Deployment or Infrastructure networks, and the guidance in this document can be modified to meet those scenarios. Additionally, the ESG supports up to 10 Interfaces allowing for more Uplink options if necessary. The use of Private RFC-1918 subnets for PCF Deployment networks was chosen due to its popularity with customers. ESG devices are capable of leveraging ECMP, OSPF, BGP, and IS-IS to handle dynamic routing of customer and/or public L3 IP space. 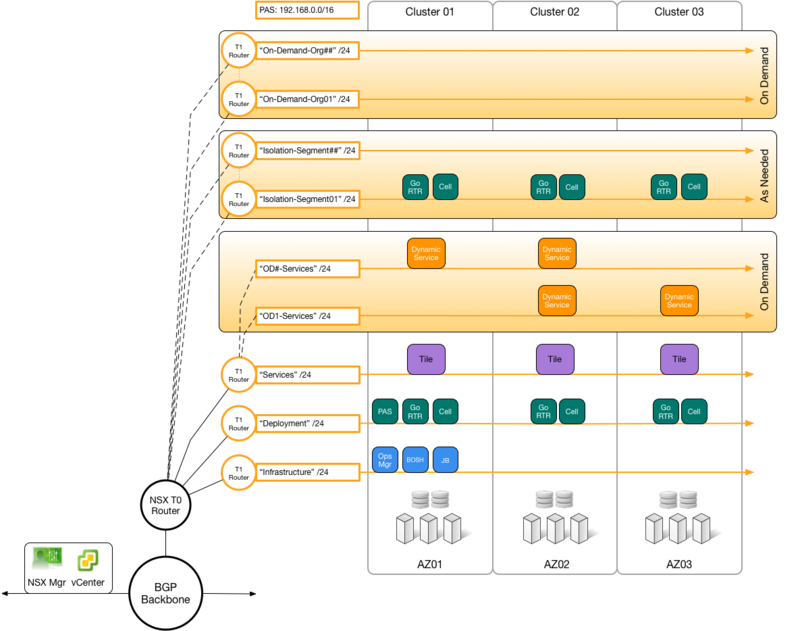 That design is out of scope for this document, but is supported by VMware NSX and Pivotal PCF.